Corner guards protect your customer's wall corners... and prevents costly claims! 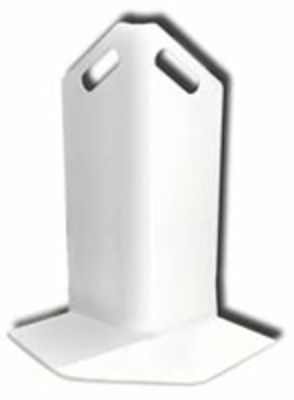 These Corner Guards prevent hoses from damaging paint or wall coverings as they go around corners. Creates a powerful, positive Moment of Truth and eliminates costly claims and repairs. Three are enough for most residential jobs. Made of unbreakable, lightweight, non-marking plastic. Gentle Rounding on Corner: This allows the hose to round the corner with less grabbing action, keeping the Corner Guard in place, especially when used on door jams. Tall, Sleek Profile: Not only does the Corner Guard look nice, it's taller than comparable products to help prevent the hose from riding over the top. Rounded Bottom Edges: With the rounded edges, the bottom plate allows the hose to glide over the corner Guard without catching. Carpet Grabbing Lip: The bottom side that comes in contact with the floor has a carpet grabbing edge that keeps the Corner Guard in place. Optional Rubber Feet: These peel-and-stick rubber feet help hold the Corner Guard in place when it is used on hard floors.